edoIn early 2017, The Gambia was hurtling toward a crisis. Its longtime president, Yahya Jammeh, had lost the presidential election but refused to accept the results and leave office. His opponent, Adama Barrow, fled the country fearing for his life, prompting his supporters to take to the streets in protest. But on the way to a violent clash, something unusual happened: Five countries in the Economic Community of West African States (ECOWAS) banded together and sent a 7,000-person force to the border of the country. All over the continent there is a push for proactive, multilateral military interventions. In Lesotho, after the assassination of an Army commander, seven nations from the Southern African Development Commission deployed a standby force to ensure stability. In the Lake Chad Basin, five countries have joined to create the Multinational Joint Task Force (MNJTF) under the aegis of the Lake Chad Basin Commission to defeat Boko Haram. And, in the Sahel, five countries have formed the G5 Sahel Joint Force to stomp out terror groups operating there. The efforts represent a break from past failures when crises were left to fester and countries allowed to implode before an international mission was approved. How can African security professionals ensure mission success? Recent missions offer lessons of the factors that can spell success or disaster for a multilateral intervention. Command and control (C2) is never easy. Defined as the military management of personnel and resources, it has been called both an art and a science. C2 is particularly complex in the multilateral arena. One mission might include troop-contributing countries (TCCs), regional organizations, bilateral partners and nongovernmental organizations. All want their voices heard. Maj. Gen. Sam Kavuma of the Ugandan People’s Defence Force spent one year as commander of Sector 1 in the African Union Mission in Somalia (AMISOM). Kavuma said being a military commander has four essential steps: plan, give orders, facilitate and demand results. Kavuma gave the example of a force commander from one country outlining a campaign plan. The contingent commander from a second country will respond, “OK, now provide me with the equipment I need to execute the plan.” If the force commander can’t accomplish that, what good are his orders? “It causes some friction,” Kavuma said. Part of the difficulty stems from the fact that some African-led missions rely on the United Nations and other partners to provide logistical support such as food and fuel. The force commander does not have full control over those partners, and it erodes his authority. “It is unwise to separate control over logistical functions from the operational commander,” Kavuma said. Another challenge of C2 in the multilateral setting is that, even when countries are under a unified command, they often must call back to their home countries for approval to take part in certain aspects of a mission. Other times, countries commit ground troops to a mission but keep air or naval assets under domestic control. As commander of the MNJTF, Maj. Gen. Lucky Irabor of Nigeria has worked hard to overcome C2 challenges. He said every operational plan he makes is ratified by chiefs of defense staff from troop-contributing countries. Although they give input, he has never had a country refuse to participate. Irabor also credited the fact that all countries have agreed to robust rules of engagement, a comprehensive concept of operations and standard operating procedure that guide the MNJTF actions. He said the primary C2 challenges for the MNJTF countries have been interoperability and language barriers. A barrier that prevents some multilateral missions from getting off the ground is strategic lift. For example, the 2012 West African-led effort to intervene in the crisis in Mali was delayed, in part, by a lack of airlift capacity. 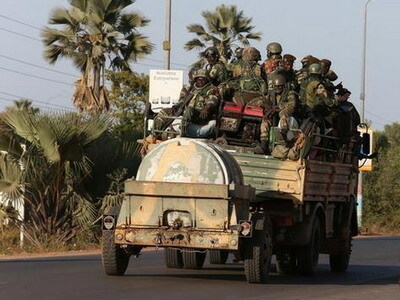 Countries willing to send troops to Mali were unable to move them to the front lines. Often, African-led peace support operations have relied on foreign partners or contractors to transport troops and equipment. The African Union has a plan to improve this. Outlined as part of its Maputo Plan of Action, the AU is setting up a Continental Movement Coordination Center that would provide for the sharing of lift capacity among member states and reimbursement to states that provide the service. The AU has conducted strategic lift assessments of various Regional Economic Communities and has identified gaps that need to be filled by 2020. The AU also is working on improving its logistics capabilities. It has opened a Continental Logistics Base in Douala, Cameroon, and plans to stock it with $100 million worth of donated equipment. Much of that equipment will be prepositioned at regional logistics bases around the continent to provide “startup kits” that can be quickly deployed in the event of an emergency. The AU plans to hold a logistics exercise in 2018. In summarizing these efforts, retired Brig. Gen. Robert Kabage, AU senior monitoring and evaluation officer, acknowledged that past AU interventions have faced logistics and strategic lift shortfalls. Future interventions must be proactive and willing to partner with all countries or organizations that have an ability to assist. The complexity of the crises facing the continent demand this openness, he said. Crises can bring countries together, sometimes even healing old divides. In recent years, new coalitions born out of necessity have responded faster and more effectively than the older peacekeeping model of a U.N. mission or a predetermined standby force. South African researcher Cedric de Coning has spent much of his career looking for an African model for peace operations. He outlined a new formula for interventions that he refers to as the “just-in-time” model. The principle is that each crisis is different and requires a unique coalition of countries to address it. This coalition should be based on which countries have the national interest to intervene and which countries have the means to do so. For instance, if a crisis arises in an East African country, a coalition may develop including bordering countries that fear instability in the region, countries with economic interests inside the country, and countries with highly trained troops and available aircraft, whether they are in the region or beyond. In The Gambia, the coalition was led by Senegal, a neighboring country that feared instability could cascade across the region. In the Lake Chad Basin, the four primary TCCs all have been affected by Boko Haram attacks and, therefore, are determined to eliminate the threat. The U.N. model of peacekeeping has historically been based on the principles of consent, impartiality and a minimum use of force, de Coning noted. African-led peace operations, including those under the umbrella of the African Union, do not have those restrictions. As such, African regional organizations and the AU have been the first to deploy to Darfur, Somalia and the Central African Republic, before the U.N. was ready to do so. But a coalition of the willing brings other baggage with it. An analysis of AMISOM by Paul Williams of The George Washington University found that the six TCCs agreed to send troops for distinct reasons, including an immediate security threat on their borders, reimbursement from international partners, and a desire to bolster their reputation on the world stage. Written by Africa Defense Forum and republished with permission. The original article can be found here.